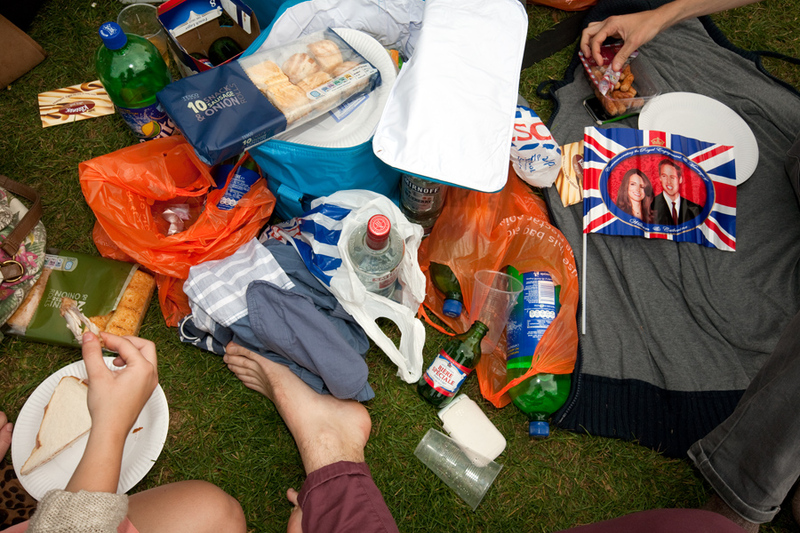 It was great fun shooting the royal wedding in April, and I’m pleased that my resulting series of picnics in St James’s Park shows a different perspective on an event photographed by millions! I started the day like many other photographers, picturing the crowds and trying to capture some of the feel-good patriotism on display around central London. After venturing into St James’s Park to have a look around I quickly realised there would be no way out for some time – we were kettled in! The procession moved from Buckingham Palace toward Westminster Abbey for the marriage ceremony. I got a fuzzy glimpse of Kate Middleton’s car passing by. The crowds were positively jubilant! It was quite a thrilling experience to see so many jolly faces in London. Shortly before the ceremony began I felt I had taken enough pictures and retreated deeper into the park for some peace. I noticed groups gathering in clusters, laying out blankets in preparation for a picnic while the audio from the wedding played on speakers around the park. This is when I realised what the day was really about; friends coming together for celebration and good times. I began to photograph the picnics and didn’t stop until the wedding was over. As a document it not only shows details of the precise moment in time – Kate and William’s wedding – but reveals something about our quirks, our eating (and drinking) habits, and the physical items we keep near to us.